Save 10% when purchasing the Addition Word Problems BUNDLE or Subtraction Word Problems BUNDLE below or save 15% when purchasing this addition and subtraction bundle which includes all of these addition and subtraction sets listed below. 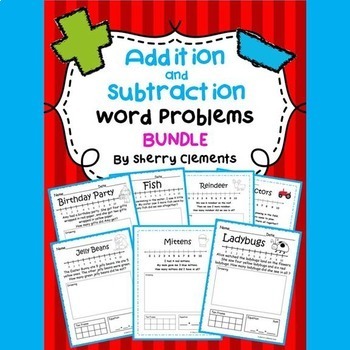 This bundle includes the following addition and subtraction word problem sets which are also SOLD INDIVIDUALLY! To see a PREVIEW, click on the individual links below. 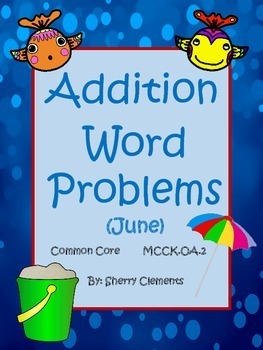 Addition word problems in this packet are correlated to common core standard MCCKOA 2. There are 166 pages including covers and back pages of each set. Each page contains one addition word problem to solve. There is a number line for students to use to solve the problem. An empty box is available for students to draw the matching picture for the word problem. There is also a ten frame box for students to use for counters or for drawing or coloring in the boxes and an equation box containing blanks, a plus sign, and an equals sign. Subtraction word problems in this packet are correlated to common core standard MCCKOA 2. There are 156 pages including covers and back pages of some sets. Each page contains one subtraction word problem to solve. There is a number line for students to use to solve the problem. An empty box is available for students to draw the matching picture for the word problem. There is also a ten frame box for students to use for counters or for drawing or coloring in the boxes and an equation box containing blanks, a minus sign, and an equals sign. This addition and subtraction word problems pack is great for DIFFERENTIATING for your student needs. Having a variety of strategies to solve the word problems is great when conducting math groups of different ability levels. Lower level students may only draw a picture while higher level students may solve the problem using all 4 strategies.